Wherein t0ast mistakes a D1 Grand Prix driver for Don King. 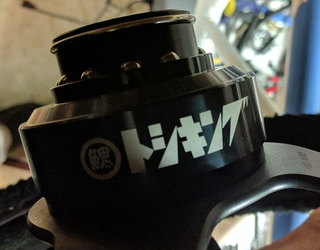 Someone trying to ID a quick release steering wheel. Explanation: Japanese uses two syllabary alphabets in addition to the thousands of logographic characters known as Kanji. One of those two applies to “native” words (Hiragana) and the other to “foreign/loan” words (Katakana). The later happens to contains more than a few similar-looking characters, like シ (shi) and ツ (tsu). Beyond that, there are also diacritics which can involve a marking similar to those double hash marks, like changing ト (to) into ド (do). Mix in a drastically over-styled font and now you too can misinterpret what should beトシキング (to-shi-ki-n-gu) asドノキング (do-no-ki-n-gu). Or maybe this is just what happens when one tries to jump in to translating a language that they’re still learning before their morning coffee.